One of the ways I choose to give back to my alma mater is by interviewing bright-eyed and bushy-tailed high school seniors and writing up detailed reports of these brief encounters that become an important part of their overall application to MIT. While each of these interviews takes about 5-7 hours of my life -- which adds up when you do 5-6 of them each fall -- it is definitely time well-spent; I truly enjoy getting to meet an amazing set of applicants each year and helping tell a part of their story to the admissions committee. About a month ago, one of my former interviewees asked if I would be willing to speak about the interview process at an event for high schoolers she was helping to organize. After having seen firsthand how nervous this aspect of the application process makes many of my interviewees, I decided that this was an opportunity to, in my own small way, help allay some of the fears associated with college interviewing. While being an Educational Counselor (MIT's name for its interviewers) is a volunteer position, and I have no official association with the MIT Admissions Office beyond the training manuals they send me annually, having spent dozens of hours interviewing and analyzing students for them has given me a valuable perspective on this aspect of the college application process. I agreed to do this speaking engagement on the condition that it was made clear that I was simply an involved alumna and not directly affiliated with the Admissions Office, and that I would be able to donate the speaking fee since it would be a conflict of interest to accept payment. Thank you to TTL for sharing a photo of the event. Imagine my surprise when this event turned out to be not the intimate group I expected, but over 2,000 anxious students and their parents crammed into a large hall at the Santa Clara Convention Center. The main purpose of the event was to inform students about the tutoring and college prep services of a local company that I will refer to as TTL. (Refer to the photo below for the full name, if you're interested.) I'm glad I showed up early enough to catch the hour-long introductory keynote speech by the TTL founder, who explained that getting into a Top School (capital T, capital S) is extremely complicated and involves a 15-dimensional proprietary vector space that TTL has developed to predict which applicants will succeed. The only way to gain access to this knowledge is by signing up ($200 off if you do it today!) Once you've entered your data into their proprietary software system, TTL plans the optimum balance of extracurricular activities, GPA and test scores you need during your high school career to maximize your chances of getting into a Top School. The keynote also included multiple mentions of dire admissions statistics like the hundreds of perfect SAT scores Harvard turns down annually. After that hour I gained a bit of empathy into why some of my interviewees show up so nervous they can barely make eye contact for the first half hour. Needless to say, I'm appreciative that I was never exposed to this fear mongering as a high schooler, and have parents who were more concerned about me doing what I love than going to a school that impressed the neighbors. I also felt a bit sheepish that my idea of SAT prep involved borrowing a book from a friend and completing half of a practice test, not dozens of hours with a tutor that my well-meaning parents had shelled out thousands of dollars for. (above) A sample slide from the keynote presentation. 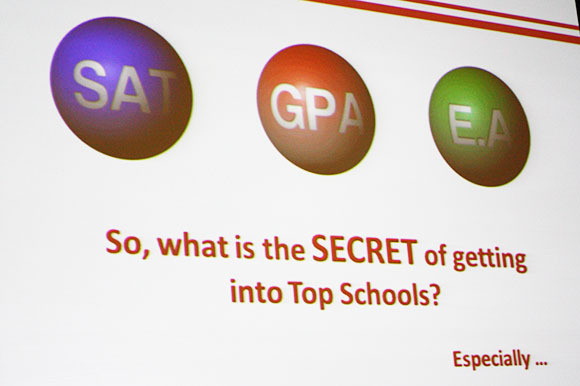 In order to understand the SECRET to college admissions, you'll need to know that E.A = Extracurricular Activities. In this context of fear, I thought it was important to do my best to ease the concerns of the audience. After asking them to get up and do a 10-second stretch -- a good trick for any speaker who inherits an audience who's been sitting for a long time, some of whom are antsy to leave -- I spent 20 minutes describing the college interview process. I did my best to make all of my advice relevant to interviewing in general, since the college admissions process happens only once, but these students will interview for many other positions throughout their lives. I broke my talk into 4 parts, and entitled the talk: "The College Interview: Showing your Best Self." I tend to prefer extemporaneous speaking, so I don't have an exact transcript of what I said. Below are the notes I prepared on how to prepare for a college interview. I must give the caveat that all of these opinions are my own, and are not meant to reflect any official policy of the MIT Admissions Office. Also, while many college interviews are similar, I cannot promise that the advice below will be entirely accurate for all schools or even other interviewers for MIT. While I've done this process a number of times, it's easy to forget that the basic mechanics of an interview -- where to meet, what to expect, what to wear -- can trip up even the best of applicants. Interviews are conducted by alumni volunteers. Some are recent graduates, while others are decades out of school. In either case, they are a good resource for you to learn about what it is like to attend that university. I meet all applicants in local coffee shops. Interviews are done in all manner of places like libraries, offices and university campuses. For MIT, any applicant can request an interview. When an applicant creates their account, I am automatically assigned to them; you cannot request your interviewer. I, personally, don't care how fancy an applicant is dressed as long as it's clean and inoffensive. While interviewees may want to wear a nice collared shirt, I firmly believe that a person should feel comfortable and confident in whatever they're wearing. Research! Know a bit about the school going into the interview and explain why you're interested in attending. Research can be done in many ways, including visiting the campus, chatting with adults in your life who went to that school and, of course, visiting a school's website. After researching, come up with a list of questions that you honestly want to know the answer to. They don't have to be the world's most profound questions, but they should be they type of question where the answer cannot be found through a Google search. Good questions also show that you know a little bit about the school you're applying to and aren't easily answered with a yes or a no. Bad: How big is MIT? Good: How have you used your MIT education in the work you do? Best: I know MIT requires students to take a number of humanities classes. How have you found these to be useful in your career? Hopefully this is obvious, but be prepared to talk about why you are applying that particular school. Surprisingly, this is not something that all applicants are good at articulating. The better you can tell this story to the interviewer, the more they can help convey your enthusiasm to the admissions committee. This probably goes without saying, but the answer you give should be genuine, and the examples below are not meant to convey that we interviewers look for a "right" answer, but rather that we're trying to understand what motivates you in a richer way than the essays and recommendations can. We also want to make sure you're not applying to the Institute because it happens to rank highly on somebody else's list of Top Schools, but rather that you've taken the time to consider whether it is a good fit for you. Bad: Because all of my friends from math team went there. Good: I know a number of people who have gone to MIT, and many of them have been able to do research with professors even as freshmen which is not something that you can do at every school. I would like to continue my research in computational fluids in college, and know that MIT would be the perfect place because of its strong emphasis on allowing undergraduates to do research. Seriously. The interview is meant to be a pleasant (!) conversation where I learn about the real 17 or 18-year-old behind the online forms you are submitting. While hopefully I can help answer some of your questions and address your concerns along the way, my primary purpose as an interviewer is understand what makes you tick. Although I've heard rumors of rogue interviewers asking for transcripts and test scores, the vast majority of us realize that the admissions office already has that information, and is a much better judge of how impressive a set of accomplishments are; I have no way of judging whether writing a concerto is more or less impressive than working at a fast food restaurant for 15 hours per week because that is not my job. In fact, I am probably the only person in an applicant's life who couldn't care less about their test scores, GPA or impressive awards. This interview is meant to complement the rest of the application, not duplicate it. Remember that this is a conversation, not an interrogation. In the case of MIT, we don't have a set list of questions that we are required to ask, and are generally happy to chat about whatever gets you most excited. Think about any conversation you have with your friends. Wouldn't it be awkward if you told them "I am captain of the debate team and we just won a national title." What would you expect your friend to say? "Wow, congrats" followed by an awkward silence is probably what would happen. While applicants sometimes feel that they're impressing the interviewer by listing their most important accomplishments, it actually tends to make it difficult to have a real conversation. What's more interesting is sharing the story, which gives the interviewer ways to understand how you think and approach problems, and also allows them to come up with good questions to ask you. In the situation above, I'd be more interested to hear about why she joined in the first place, how she student researched the topic and worked with her teammates, the lessons she learned along the way, and how she fulfilled her role as captain of the team. While the national championship is an important footnote, it is far less important than the process that got the applicant there, and the entire journey is much more interesting to chat about. Along this vein, feel free to ask questions when it feels appropriate, or bring up topics that excite you. There may be something you really want the school to know that the interviewer just doesn't know to inquire about. In general, I love it when applicants talk about activities that excite them rather than those that they think will impress me. Given that interviews can be a bit unpredictable, there is one surefire way applicants have to direct the conversation: bring a prop. In the design industry, we always say that it's bad to present to a client without a prototype, and the same applies in any situation where a photo or object can bring richness to a discussion. Remember Show and Tell in Kindergarten? Wouldn't it have been a lot less fun if it was just Tell? While I have yet to actually have an applicant bring something they've worked on, I am always hopeful that one will. Imagine having a discussion about an interesting mechanism that a student designed for FIRST robotics. Wouldn't it be much better if you could actually see the mechanism she was talking about? The same goes whether an applicant's interest is in computer programming, musical compositions, comic books, or anything else. Just make sure not to overdo it: while it's great to see something you've made, that doesn't mean we need to spend the entire interview discussing it. Contact your interviewer early; most applicants wait until near the deadline, which means that your interviewer might not have as much time to write up the report for your interview. I find that I am freshest at the beginning of the interview season, and can write up a more nuanced report for the candidate when I have 2-3 weeks to focus on theirs before interviewing another candidate, versus later in the season when I am trying to cram 2 or 3 applicants into the week before I take off for Christmas. Remember that your interviewer is a volunteer, and a quick thank-you email expressing gratitude for their time is a nice gesture. This is actually good life advice: don't put anything stupid on the internet. While I don't ever do a background search on applicants, I did have one put up a status on Google chat informing all of his contacts that he'd been mortified to spill coffee on himself during our interview. He had no idea I could see this, given that I was in invisible mode. While this particular incident was harmless, it was a good reminder to me that you never know who will see the things you post, so it's best to cautious. To finish up the speech, I rambled on a bit about how there are many good schools out there and it's important to find one that's right to you. I also assured the audience that if they were committed enough to be sitting through a talk like this on a Sunday afternoon, they shouldn't be worried about gaining admission to a wonderful academic institution. I then left, feeling very thankful that my own college admissions process in no way resembled the TTL approach.